Many of us come to yoga for lots of different reasons, for gaining greater flexibility of body, strength, right tone of the body, physical healing from injury, reducing stress or just to gain a deeper understanding of life. The beauty about Yoga and its benefits are huge that anyone can benefit from it. Yoga is good to everyone and anyone can be benefited from Yoga, practicing regularly. There are many benefits of astanga yoga as discussed below. A light and energized physical feeling. A stronger, more flexible body, giving your muscles and joints a greater range of motion and reducing unnecessary fat. An improved nutritional intake metabolism and digestion and helps to clean the body of toxins gathered through an unhealthy lifestyle. With higher energy levels, yoga replenishes lost vitality to the body. The body and mind is kept youthful, fresh and powerful. The mind calms; concentration and memory improves through the sharpening and focusing of the mind. Quality and consciousness of the breath improves. Yoga functions as a fabulous supplementary training for sport and physical activities. Yoga is therapeutic for muscle pain and reduces the risk of overextending and damaging muscles. Overall most of the people describe a feeling of well being and balance with a regular practice of yoga in their lives. 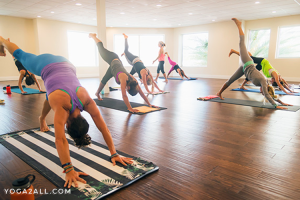 The benefits of Ashtanga Yoga are immense, ashtanga Yoga is a dynamic form of yoga where breath and movement is connected so that posture follows posture in a flow from start to finish. Vinyasa means coordination of movement with the breath. When to inhale and exhale and how to move from one posture to the next is well defined. Postures are done in a certain sequence. The primary series of Ashtanga Yoga is also called “Yoga Chikitsa”, which means yoga therapy. The purpose of this series is to strengthen, adjust, align and clean the body. The intermediate series “Nadi Shodana” strenghtens and cleans the nervous system by opening and cleansing the energy channels of the body. For most people, it takes at least a couple of years to establish a steady practice of the primary series. There is no hurry, yoga is a lifelong practice and a solid foundation is so important for the practice to develop. Ashtanga Vinyasa Yoga affects both the physical and the mental levels of the body and mind.